A hard-hitting report faulting the Obama administration for its war on leaks and other efforts to control information — "the most aggressive I've seen since the Nixon administration, when I was one of the editors involved in The Washington Post’s investigation of Watergate," said its author, Leonard Downie Jr. — might have made waves in the journalism community when it was released two months ago, but Attorney General Eric H. Holder Jr., says he hadn't heard of it. 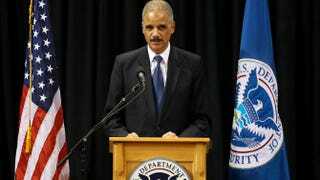 "We try to be as transparent as can be," Holder told visiting members of the Trotter Group, a national organization of African American newspaper columnists, on Thursday. "The best government is the one that is most transparent." Brian Fallon, director of the Justice Department's Office of Public Affairs, told Journal-isms that he had answered questions for Downie before the October report was released and that his boss simply hadn't gotten to it yet. In the latest example of tension between the Obama administration and the news media, news organizations complained last month, "The administration of President Obama is routinely denying the right of independent journalists to photograph or videotape the president while he is performing official duties. Instead, the White House is issuing visual press releases — handout pictures taken by official government photographers — and expecting news outlets to publish those." Some outlets, such as USA Today, have refused to do so. The black journalists, meeting in Washington for their annual conference, heard from three Cabinet secretaries, policy experts on African American issues and Valerie Jarrett, senior adviser to the president. They heard Holder recommend to a student the much-discussed 2010 book "The New Jim Crow: Mass Incarceration in the Age of Colorblindness" by Michelle Alexander, and declare that prison reform, along with voting rights, was a top priority. Department of Education Secretary Arne Duncan said he believed in the "school-to-prison pipeline" that progressives have derided and said his department was acting to help dismantle it. He included "social justice" as one of his department's priorities. Housing Secretary Shaun Donovan pulled out the startling statistic that African Americans lost 50 percent of their wealth from 2005 to 2009. He said billions had been spent overall to rebuild home ownership, but that figures specific to African Americans were not available. Jarrett and others made it clear that Obama's Dec. 4 speech on income inequality and opportunity for the poor was intended to guide the administration's domestic policies for the rest of his administration. Obama said then, "We know that people's frustrations run deeper than these most recent political battles. Their frustration is rooted in their own daily battles, to make ends meet, to pay for college, buy a home, save for retirement. It's rooted in the nagging sense that no matter how hard they work, the deck is stacked against them. And it's rooted in the fear that their kids won’t be better off than they were." The speech was music to three public policy advocates who spoke Friday — Wade Henderson, president and CEO, Leadership Conference on Civil Rights; Hilary O. Shelton, senior vice president for advocacy and director, NAACP national office; and Sherrilyn Ifill, president and director-counsel, NAACP Legal Defense and Educational Fund. The idea that one's ZIP code has come to be tied with chances for advancement in life was cited by speakers within and without the administration as evidence of the problem and part of the case for solutions. One such response is the proposed "Promise Zones." "This initiative will designate a number of high-poverty communities as Promise Zones, with which the federal government will partner and invest in to create jobs, leverage private investment, increase economic activity, expand educational opportunities, and improve public safety," according to the Joint Center for Political and Economic Studies. In North Carolina, "Teachers are angry about stagnant salaries, the phase-out of tenure, and the end to pay increases for earning advanced degrees," Lynn Bonner wrote Dec. 4 for the Raleigh News & Observer. "Teachers and parents protested low salaries and new education policies at schools around the state last month. The state ranked 46th in the nation for average teacher pay in 2011-12." Education Secretary Arne Duncan, former CEO of the Chicago Public Schools, said the news media have something to do with this state of affairs. "In North Carolina, if people went to the voting booths with education at the top of the list, those kind of cuts wouldn't have happened," Duncan told the Trotter Group on Friday. "There's not enough demand for change," Duncan said. The media should be "helping parents understand that what was good enough in the past is not good enough any more. "We're competing with kids in India, China, South Korea," Duncan said. As he has in several speeches, Duncan repeated a story about President Obama asking the president of South Korea, "What is the biggest education challenge you have?" Leonie Haimson blogged in 2011 for Huffington Post. "Without hesitating, President Lee [Myung-bak] responded: 'The biggest challenge I have is that my parents are too demanding.' "
However, Haimson added, "Recently, Byong Man Ahn, the former minister of education in South Korea, warned Americans against praising the 'educational zeal' of South Korean parents, saying that Korean schools had become too test-centered and too focused on rote learning, and that they 'force the students to memorize so much that they experience pain rather than pleasure [of] acquiring knowledge through the learning process.' . . ."
Regardless, Duncan, his aides and others who were asked to evaluate news coverage of their fields did not shrink from offering their thoughts. James H. Shelton III, assistant deputy secretary in the Education Department's Office of Innovation and Improvement, urged that stories be developed about states' withholding money for colleges. "That piece of things seems to be missing from the public dialogue," Shelton volunteered. Similarly, Shelton said news outlets should report on schools that have transformed themselves in two or three years, thoses that are "really doing good, hard work," news in which "people aren't screaming at each other." Shelton also struck a theme echoed in another discussion about public policy. "All of our work is about making triple bank shots," he said. "[Reporters] think about these responses in isolation," when in reality school issues are tied to those elsewhere in the community. For example, Marc Mauer, executive director of the Sentencing Project, told the journalists that racial disparities in the length of prison sentences is declining significantly. That is partly due to the campaign to publicize racial profiling, to the expense of keeping people in prison, to overcrowding caused by longer prison sentences and to use of alternatives such as drug courts. "We answer to these silos that make it harder to connect the dots," Wade Henderson, president and CEO of the Leadership Conference on Civil Rights, told the group on Friday. "Marry these pieces together," urged Sherrilyn Ifill, president and director-counsel of the NAACP Legal Defense and Educational Fund. Education cannot be separated from economic justice and economic development. Education "used to be . . . an investment," she said. "Now, people are scared. Everything is being called into question." The economy has made it harder to secure a job after graduation, and even if students do, they are saddled with loan debt. I'm not sure there is an understanding of the way these issues are playing out across the board in the lives of African Americans. Hilary O. Shelton, senior vice president for advocacy and director, NAACP national office, added that media consolidation means news consumers are "getting a much more homogenized picture of America. We're getting less diversity in the reporting of these stories." Panelists discussing the Affordable Care Act seemed to agree that reporters had not done their homework before problems with healthcare.govbecame front-page news. "Journalists should have done a lot more digging," said Rea Hederman, director of the Heritage Foundation Center for Data Analysis, a conservative group. "Some folks were taken by surprise by the massive disruptions," he said, when "people in the policy world knew" that that would be one result of implementing the act. Anton J. Gunn, director of external affairs for the U.S. Department of Health and Human Services, agreed that reporters had not done their homework, though his position on the act is the opposite of Hederman's. "There hasn't been enough digging," Gunn said. The reporting "is completely on the surface." For example, the act authorizes deployment of 8,900 clinicians to administer to 9.3 million people as part of a Peace Corps-like National Health Service Corps. "It's a story that's never been told," Gunn said to the group. "An ounce of prevention is worth a pound of cure." The third member of that panel, Brian D. Smedley, vice president and director of the Health Policy Institute of the Joint Center for Political and Economic Studies, said terminology was impeding progress. Specifically, "the use of the term 'Obamacare'," Smedley said. Media have "accepted this term as if it were a legitimate term," when surveys have shown a negative public reaction to it, in contrast to the response to "Affordable Care Act." Sen. Tim Scott of South Carolina, a black Republican, consistently used "Affordable Care Act" in his presentation to the group Thursday, even though he opposes the law. Asked why he had not tried to demagogue the issue with the term "Obamacare," as have other Republicans, Scott told Journal-isms, "Let's not politicize this. Let's talk about the people who need the care." Did the CIA Help Capture Mandela in 1962? "As South Africa prepares to hold a state funeral for Nelson Mandela, we look at how the CIA helped the South African government track down and capture Mandela in 1962," Amy Goodman said Friday on Pacifica Radio's "Democracy, Now!" "Several news outlets have reported the actual source of the tip that led to the arrest of Mandela was a CIA official named Donald Rickard. On Thursday, Democracy Now! attempted to reach Rickard at his home in Colorado. On two occasions, a man who picked up the phone hung up when we asked to speak with Donald Rickard. The activist group RootsAction has launched a campaign to urge the CIA to open its files on Mandela and South Africa, and the media watchdog group Fairness and Accuracy [In] Reporting has questioned why corporate media outlets have largely ignored the story. We speak to journalist Andrew Cockburn, who first reported on the CIA link to Mandela's arrest in 1986 in The New York Times. . . .
"AMY GOODMAN: Talk about what you found out in the mid-'80s. At this point, Nelson Mandela had been imprisoned for over 20 years. "ANDREW COCKBURN: That's right. He had been — I found out — I reported that he had been—as you mentioned, that he had been arrested, thanks to a tip from the CIA, while disguised as a chauffeur. He was actually — what I had heard at the time was he was actually on his way to meet an undercover CIA, an American diplomat who was actually a CIA official. So it made it rather easy for them to alert the South Africans where to find him. "I mentioned — I thought it was particularly interesting to report when I did in 1986, because at that point it was just when the sanctions were being introduced over—voted through by the Congress over President Reagan’s veto. So, and I had noticed that in the sanctions legislation, it said there should be no contact, official contact, with the South African military, and so on and so forth, except when intelligence required that, you know, they did have to have contact. So it was ongoing, this unholy relationship, which had led to Mandela being arrested and locked up for all those years, continued on through the ’60s, through the ’70s, through the ’80s, absolutely flourished, with the — for example, the NSA routinely handing over intercepts of the ANC to the South African secret police. And it was absolutely outrageous. "AMY GOODMAN: This is the National Security Agency that is, of course, the subject of so much global controversy right now, the NSA gathering this intelligence to give to the apartheid regime. "ANDREW COCKBURN: That’s right. I mean, it was — it was just absolutely routine. And, you know, we have to — this was all — maybe they would have done it anyway, but it was certainly in the Cold War context. I mean, there was — it’s hard to remember now what a sort of lather people got into about, you know, the Soviet threat to the trade routes. And there was a naval base, African naval base — or there is one at Simon’s Town, near the Cape. And there was, I remember, sort of the right — the defense lobby were continually going on about the terrible threat of the Soviets maybe getting hold of, you know, Simon’s Town, seizing vital facilities. "And it was an absolute — I mean, people, not surprising — well, people have sort of forgotten just how — what a Cold War battleground southern Africa was. Not only did they turn over Mandela, but they had this very close relationship. U.S. military intelligence cooperated very closely with South African military intelligence, giving them information about what was going on, what they were collecting in the rest of southern Africa. And, in fact, you know, the two countries — CIA and the South Africans collaborated on, you know, assisting the UNITA in the horrible civil war in Angola that went on for years and years with thousands of people dying. So, you know, this wasn’t just a flash in the pan, the tip-off that led to the coordination on the arrest of Mandela. It was absolutely a very deep, very thorough relationship that went on for decades. . . ."
Black Film Critics Group Honors "12 Years a Slave"
"The African-American Film Critics Association (AAFCA) has named 12 Years a Slave as the Best Picture of 2013," the association announced on Friday. "The Fox Searchlight film’s also earned Best Director, Best Screenplay and Best Newcomer honors for Steve McQueen, John Ridley and Lupita Nyong'o. The organization, which represents the leading African-American film critics nationwide, will formally present its awards during a private ceremony on Friday, January 31, 2014 hosted by Orlando Jones at the Taglyan Complex in Hollywood, CA. . . . "
The association consists mostly of freelancers. 2. "Lee Daniels' The Butler"
3. "Mandela: Long Walk to Freedom"
9. "Out of the Furnace"